Technology continues to advance at an accelerated pace and trying to keep up with it is a challenge even for the biggest companies. Small and mid-sized businesses rely on the expert network support and computer consulting services offered by Digicomm Solutions. Digicomm has grown as a reliable provider of full-service network support and project-based IT services in the region. Our distinct team of highly trained, certified computer network consultants and engineers stay current with the latest technologies and systems to ensure you receive cutting edge solutions that are tested and follow industry best practices. We understand the needs of small and mid-sized businesses and we know how to find and implement creative solutions that get enterprise-class results without the enterprise-class price tag. We offer outsourced IT services for businesses of any size. 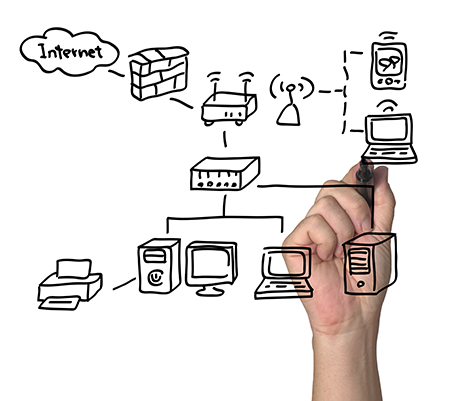 Servers, desktops, mobile, Exchange, remote monitoring… we cover it all. Digicomm can augment your current staff and help them achieve and do more, or we can serve as your sole and trusted in-house tech resource. Either way, we have the best computer consultants in the region ready to support your business and technology needs. In our fast-paced IT world, you need more than just keeping your laptops, desktops and printers working. Digicomm offers many valuable services that address today’s demanding mobile workforce. Whether it’s computer and network server support, data security and backups, network design and support, IT help desk support, or remote technical support and onsite IT support, Digicomm is the best choice for professional, end-to-end local IT outsourcing. Give us a call today! Digicomm Solutions gives businesses the opportunity to improve processes, systems and flow of communication with a customized business server setup. Digicomm offers a variety of services to get you started with your new equipment. Email forms an important medium of communication in today’s work environment so let Digicomm’s technicians help with the issues you are faced with at any time when setting up or repairing your email. Between online financial management systems, social network groups and businesses reliance on internet access - it has never been more important to keep your network and systems secure. For those who have already been infected we have solutions to meet your needs as well. Thousands of computers are infected every day by new virus threats. Let our experts get you back up and running - and help protect you from future virus'. Digicomm knows the best way to fix a problem is to prevent it from happening or at least to have a plan to reduce the risk of damage done by the disaster. That is why our expert team keeps up to date on all current disaster recovery technology.